One person who’s been along for the ride from the very beginning is Hans Königsmann, a German and a chief engineer at SpaceX. He is in Bremen, Germany, this week for the International Astronautical Congress, where he will be presenting his company’s latest plans. SPIEGEL ONLINE spoke to him before the big event. SPIEGEL ONLINE: Mr. Königsmann, there is one thing we don’t understand. Your new rocket will be called “BFR.” The “B” stands for big, the “R” for rocket. What does the “F” stand for? Königsmann: Officially it stands for Falcon. Big Falcon Rocket. Königsmann: You can pick whatever you want for the “F.” (Laughs.) It’s a tongue-in-cheek joke about something that is a pretty serious vehicle. SPIEGEL ONLINE: The BFR is supposed to fly to the moon and to Mars. When exactly? Königsmann: In 2023, five years from now. That certainly is an ambitious goal. But I think it’s feasible. SPIEGEL ONLINE: SpaceX has a history of setting over-ambitious deadlines for itself and then correcting them later. Why not be more realistic from the start? Hans Königsmann, 55, is chief engineer for launches and vice president for build and flight reliability at SpaceX. He has been working for the company since 2002. Königsmann was the fourth technical employee to be hired by SpaceX. Before, he studied air and space technology in Berlin and Bremen. He has previously worked at the University of Bremen (ZARM) and at the company Microcosm in California. Königsmann: Over the years, I’ve gotten used to ambitious goals and in some cases, we actually meet them. In other cases, we slow down. We make sure that everything is safe before we go. In the last 10 years, yes, we might have failed to meet a scheduled goal every once in a while. But we have accomplished a huge amount of innovation and have done new things. When you accomplish something big and you look back later, it doesn’t really matter if that rocket was launched in January or December of a particular year. SPIEGEL ONLINE: The Japanese billionaire Yusaku Maezawa plans to buy a BFR so that he and a group of artists can fly around the moon. How much will he pay for the trip? Königsmann: I am sure the flight is not cheap, although I don’t know the exact price. But Mr. Maezawa has pointed out one thing: Money is not the most important thing. He wants to emphasize that the ticket was not simply purchased by a billionaire, but by a dreamer. SPIEGEL ONLINE: Isn’t it irresponsible to send completely untrained people in a brand-new vehicle on such a trip? Königsmann: I am sure they will have been trained properly by the time they fly. 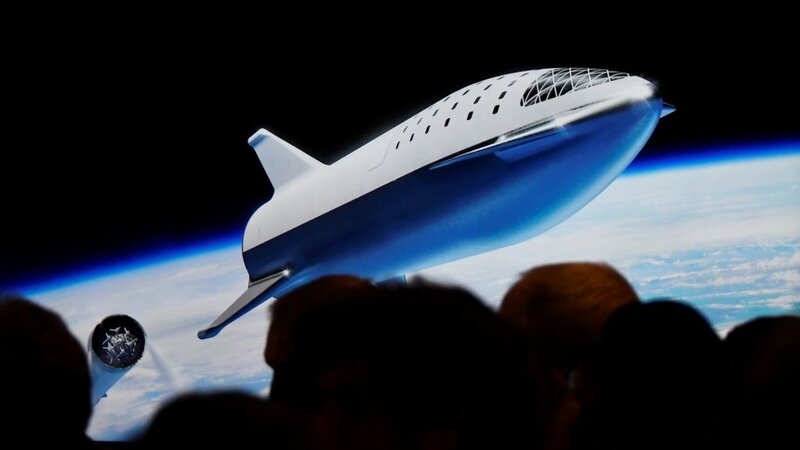 SPIEGEL ONLINE: But the space ship will still be totally new. Königsmann: We have been working on human spaceflight for a few years now. We are close to flying astronauts. There are a few things that are important when you fly humans. Right now, we are learning these things and we will apply all the lessons to BFR and make sure it is a safe and reliable vehicle. SPIEGEL ONLINE: So far you have made a lot of your money with U.S. government contracts. You are supposed to fly not only cargo to the International Space Station but also astronauts. Yet these flights keep getting postponed. What does NASA say about you presenting lofty plans for the moon and Mars instead? Königsmann: Crew transportation is one of our top priorities in the company. We are at a point where the hardware is almost ready. Now we are working on certification and paperwork. Personally, I feel better if you slow down during that time and do things really carefully to make sure you don’t miss anything. If the launch is postponed for a month or two, it will be time well-invested. SPIEGEL ONLINE: So far you haven’t managed to complete even a single one of the necessary qualification flights for the crew transport to the ISS. Königsmann: You need to have two things: the hardware and the paperwork. Both take time. Those are the two reasons that we haven’t had a launch yet. But we will pretty soon. SPIEGEL ONLINE: Who will undertake the first commercial crew flight to the ISS? You or Boeing? Is this a race? And if so, who will win? Königsmann: We will see. We are working very hard to get this done safely. I am responsible for flight reliability in the company, not for scheduling. You are asking the wrong person if this is a race or not. In my opinion, it is not a race. SPIEGEL ONLINE: Arianespace, your European competitor, has complained that SpaceX charges the U.S. government too much and can therefore make cheap offers to commercial customers. How do you respond to that? Königsmann: That makes me laugh because it is obviously not true. We list our prices on our website. The U.S. government wants certain extra tasks performed for a launch. We need to do less work for a commercial launch. But for the launch of a “Dragon” freighter to the International Space Station on behalf of NASA, for example, we build the hardware, we have mission control for an entire month, and so on. And for other satellite launches, the government wants additional paperwork, additional tests. All of that costs money and that is what we get paid for. There is no subsidy. SPIEGEL ONLINE: Reusing rocket parts is a central part of your strategy. Arianespace says this doesn’t make sense to them from an economic standpoint. What’s your take? Königsmann: Reusability is a huge game changer. It makes perfect sense to use something more than once. It will make rockets significantly cheaper than before. You might want to look at your business model if you don’t see that. SPIEGEL ONLINE: Do you have customers who insist on having new rockets instead of previously used ones? Königsmann: We originally had customers who only wanted new rockets. But that happens less and less. With every recovered piece of hardware, we learn. And we show that to our customers. That has convinced many of them. Most are now opening up to the idea of pre-flown rockets. And we have convinced one particularly important customer: NASA uses previously flown rockets and “Dragon” space ships on supply missions to the International Space Station. The reason is simple: They are safe, they are reliable and they cost less. SPIEGEL ONLINE: Your boss Elon Musk gives fascinating talks on journeys to the moon and to Mars. At the same time, he regularly vexes the public with rather strange statements on other topics or with the fights he engages in on Twitter. Is that a burden for SpaceX? Königsmann: Not really. I know Elon very well. I don’t see him as a burden to my work. SPIEGEL ONLINE: Mr. Musk is also head of the car company Tesla, which is going through turbulent times. Does that have implications for the work of SpaceX? Königsmann: Tesla and SpaceX are two separate companies. There is no overlap. SPIEGEL ONLINE: Could you imagine SpaceX without Elon Musk? Königsmann: No, no. To me Elon is SpaceX. I mean, we are a mature company. We have our processes, we have our leadership. And Elon is an important part of that leadership. SPIEGEL ONLINE: Elon Musk has expressed the desire to fly to Mars himself. What would that mean for the company? Königsmann: That would mean that we have succeeded in going to Mars. I think that would be excellent. SPIEGEL ONLINE: Would you be interested in going as well? Königsmann: No. I would love to go to orbit, that is pretty cool. Hanging out in zero gravity, I have always enjoyed that on the parabolic flights with airplanes that I have taken part in. But Mars? I think I am too old for that.